For works of modern art, not only are the conditions by which the art is borne important but also the place where it is exhibited. The latter is of even greater importance, as interactivity, contact with the viewer and the possibility of producing a spontaneous, creative gesture while also receiving a sentient response are the most basic conditions of existence for the modern artist. Where have exhibitions of modern art not been held if already in empty, ill-omened hangars, reeking garbage dumps, unkempt dirty cellars, and psychiatric wards? Of sole importance is the escape from the asphyxiating sterility of official exhibition halls and the hypnotic bore of the "classical" museum space. The art project "Mourning for Art," from the somehow-never-aging Babi Badaloff is a glaringly bold and disarmingly naive escapade from the concentration camp of the official space for "true art." The project, its formal simplicity aside, is comprised of several levels of perception, which traverse one another in the conception of the exhibition space. First, the work of the artist is being exhibited inside a tent, the fagade of which arouses a rather ambiguous reaction from the average Azeri. 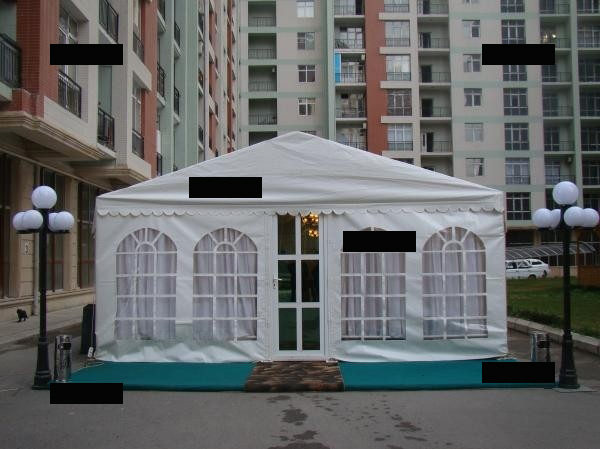 The truth is that such tents are used in the regions of Azerbaijan to celebrate weddings and in the capital of the republic, in Baku, for wakes. Is this not a paradox? Yes, but a paradox easily solved .within the context of the analogous (mytho-poetical) thought process of ancient peoples, where such contrary poles as tempestuous glee and inconsolable woe, life and death, the beginning and the end, coexisted amicably with little apparent conflict. This "ethno-genetic" way of thinking rests close to the Higher Being, who with his invisible presence dissembles all contradictions. But, in this case, the artist concentrates all of the viewer's attention on the tent as a place where wakes are held with the logical necessity of likening the exhibition of his own paintings to a kind of mind corpse. This is the primary conceptual intrigue. Radical artists of the modern epoch have never dealt well with the theme of the death of art. There is even a popular phrase: "Art is dead but artists live." Beginning with the intellectual anarchism of Marcel Duchamp and moving through Joseph Boyce's bio-mystical message of social plasticity (a broadened understanding of art) and the extreme Austrian situationism, the idea of an uninterrupted refutation of socially approved forms of culture became the only adequate intellectual approach for the "honest" artist-radical. The discussion revolves around the aversion of the socio-cultural mechanism, which converts the live, spontaneous, artistic gesture of the free artist into a polished cultural product differing little from other material "products" on the global human supermarket where everything is bought and sold. The modern "civilized" world (through the optics of so-called social engineering) places a symbol of equality on works of art, condoms, toothpaste, Coca Cola, hygienic tampons and any other such thing - the only difference is in price. "Spirituality" is devoured by the sole deity of modern man, by the golden calf, expressing oneself in the cult of a quantitative economic relationship towards life. As the result of such an approach is the triumph of everything, which is most mediocre and, in perspective, ungifted. The current project, and almost all of Babi's art, is in part nothing but a reaction on this theme, soaked in sarcasm and irony. That is, on the theme of the interrelationship between art andSociety, taste and tastelessness, cheap and "high" art, the aggressive ignorance of the gluttonous crowd and wisdom of lonely professionals, who are chased to the periphery of social life by this same thankless crowd. The theme of the death of art is truly a reflection of an artistic protest against all attempts to occult creative actions/activities, which inescapably lead to the commercialization and mortification of works of art. As soon as society notices the work of art and registers the work in the dusty archive of art history or in numerous "culturological" catalogues and display the work in a respectable museum, the art dies ... it becomes a cadaver. In this way, from the point of view of many radical artists, the museum as a social institution is nothing but a "cultural" cemetery, where the remnants of "what was once art" rests. We remember the extreme gesture of Picasso calling for all museums to be burned down. Babi - and possibly not acknowledging it himself- lives and works by example of the great Chinese masters of Tao and Zen Buddhism, who were the forefathers of conceptual art. The Taoist wise man said: "The spoken truth is a lie." Everything that belongs to fixation, calculation, registration dies. True art, as life itself, is a process taken in a clean absolute state of eternal motion, change, pulsation, becoming, transformation, head-spinning interactivity of metamorphoses in horrid labyrinths of un-virtual reality (conceptualism postulates: "the idea is a work of art" is an understanding of the idea as the artistic process itself). Art says: "The process is everything, the result is nothing". For, the result which we see in museums, at auctions, is the final point, the halt, death. The idea of art is not accomplished in the fleeting completion and professional maturity of paintings and objects, but in the live substation of artistic activity, in the intensiveness of the energetic presence of the author himself, his aura, as the totality of his passion, intellect, disease, happiness, pain, childish spontaneity and life experience. You can look at and examine Babi's works, accept them or negate them, call them genius or ungifted (in the context of ontological unity of being, it is one and the same), you can even buy them and hang them at home or in the office ... or, you can not look at them at all, simply attend the peculiar wakes and become better acquainted with the artist. I assure you that you have nothing to lose; it is a very entertaining exemplar, a confused articulation and yet vivid mix of deep Eastern natural mountainous vitality and naive spontaneity with a dynamic Eastern European mentality and pragmatism. In short, the composition of incompatible energetic principles stipulating the traumatism of artistic and life experience "culturally" shocks anyone who becomes acquainted with it.